Read again what i stated. Edit: Anyway, 28 miles, unless im missing the point as well as the urinal. So if we have a 2nd referendum are you supportive of a new one every 2 years? Just want to make this clear... you are for regular referendums on EU membership, yes? So the result of a 2nd one would be for just the next 2 years before we voted a 3rd time? Im for whatever results equals less austerity, no recession, and most definitely no Tory tampering with our human rights. I'm for a future for my kid, where Westminster are restrained somewhat form tampering with there existence. That doesn;t answer the question. 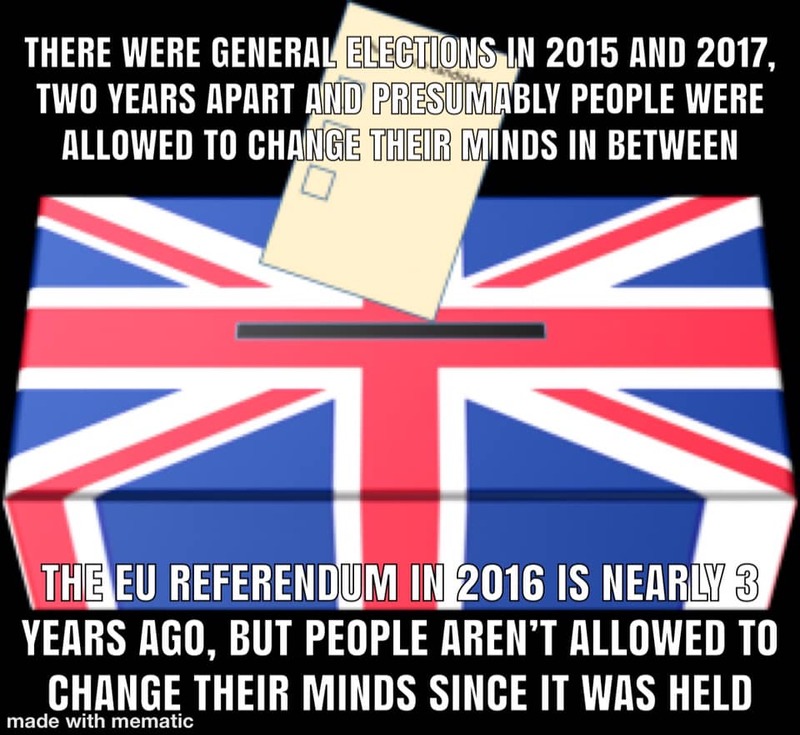 If we should have a referendum every time we change our minds then we'd be having them every couple of years and be in a perpetual state of uncertainty. The point you were making just doesn't hold up to scrutiny. I do agree that we should do what is best for our future - that means a no deal Brexit and a return to trading with the world on our own terms. UKTruth i dont know what age you are, but i would love to know when we did not live under a perpetual state of uncertainty? If that's not been the colour of our day since at least the time of the banks going pop, i don't know what is. If i was going to call such a rose coloured enigma or state it would be around 1991-2000, and even then it was illusory. The answers to your queries rely on absolutes and there are none to be had, because nobody has a clue what's going on or is ultimately going to happen. I think whats best for our future is not giving Westminster and Tories free reign to tamper with such. The EU is indeed part of the world, you see we exist within a network, designed to facilitate the transportation of goods and people, all over the globe within a matter of hours, a global network. Brexit, in my eyes, is a step backwards, not forwards, hence the demographic responsible for such a senile vote i suppose.